Temperatures dropping to near zero, not the best conditions to be refereeing futsal, but with a flask and a couple chocolate biscuits I set of to Novartis anticipating a long painful night. Quite the contrary, I experienced one of the best night’s futsal ever. Usual referee John Mawer text me earlier I was in for some good futsal. The futsal from every team was better than good, it was excellent. The current under 10/11 players must be best we have ever had; certainly there has never been so much strength in depth. Past years we did not use the ‘retreat rule’ as a consequence many managers allowed their keepers to throw the ball long in hope someone would head it on. Now they have to pass the ball out. Same with corners and kick-ins, past managers, I want use the word coaches, just had their players boot the ball high and long from any position. Not current coaches/managers, to a man their team pass; move and are creative. Don’t let score fool you; this game was not as one sided as score might suggest. Healings more clinical finishing had a lot to do with goal difference. .
Borough had too many ‘creative ‘players for Healing to contain. Noticeable Borough created via using their keeper as a passing option, Healing restricted their options by not matching them. 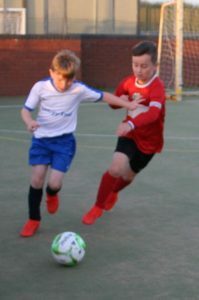 Immingham play at a pace that is no stop. Lose the ball they want it back, receive the ball and ‘where is next pass going.’ It’s full on but it works for team. NTC was under some self inflicted pressure by conceding too many free kicks. The younger Wybers team passed the ball with a style that would do credit to an Academy side. Unfortunately for Wybers Immingham was ruthless in exploiting the counter attack. 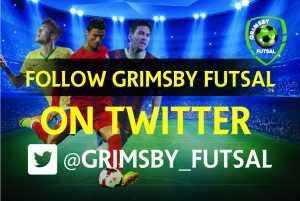 This entry was posted in GTFC Futsal on January 29, 2019 by Kevin Bryant.